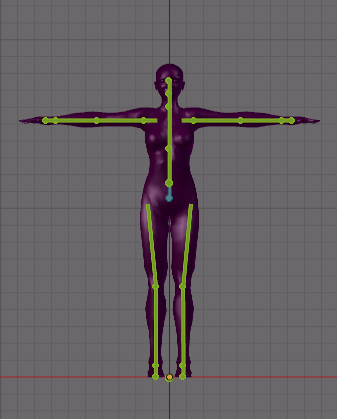 In previous Avastar releases we always needed to eventually use the T-posed Character when we were creating models and attachments with human shapes. We did so to keep compatible to the SL T-Pose rig (experts may remember the Alter to Restpose Option that we provided for this purpose). In Avastar-2 we are no longer forced to handle the T Pose. Instead of that you can now work in any Restpose (technically named: Bind Pose). Avastar can now calculate the necessary extra data that is needed by the SL Importer to handle these Rigs properly. A Develoepr Kit using an A-Posed upper body Rig. If you use another creator’s rig for creating compatible attachments, keep with the Restpose that is provided by the creator. If you create your own Rig, you are free to use whichever restpose you like. But once you defined your rig, do never again change the restpose to make sure your attatments match to your Body. The use of bind poses is a somewhat confusing topic at first. This is mostly so because Blender actually does not support this feature. 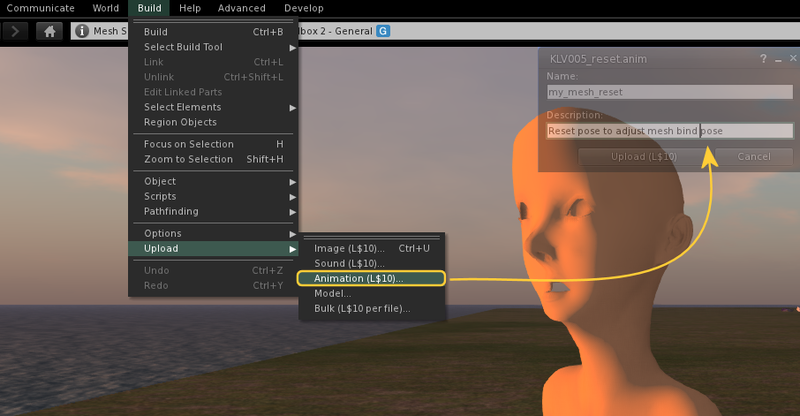 Avastar adds the necessary functionality but it still has to work with the Blender limitations. This makes the usage of Bind poses a bit complicated. However they are so useful in regard to SL that we strongly recommend to get familiar with the concepts and the usage scenarios. 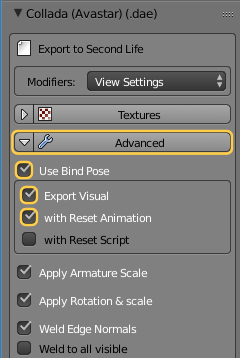 When your Appearance Sliders are disabled, then you can not set the use bind pose options. However you still can follow this workflow for editing your rig. 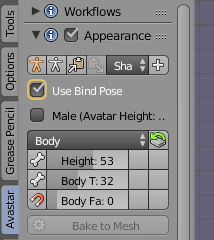 When your Appearance Sliders are enabled, then we propose that you now enable the use bind pose option. However this is not a strict requirement. 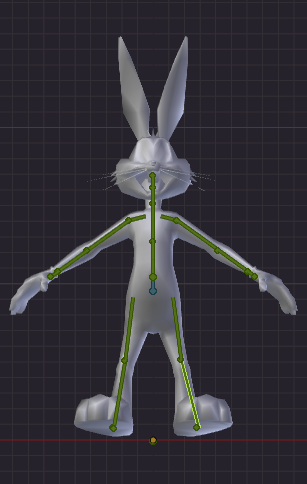 Now pose your Armature into the pose best matching to your character by using the Appearance sliders and the green animation bones(!). You can also use the gender option when you work on a male character. Make sure that your Mesh character (or attachment) is not yet bound to your Rig. Please use only the green animation bones for this step! When you use the blue and purple pose bones then you later might not get the results that you expect. For more details about the panel options see the Avastar Tool tips in the Posing Panel or read the pose panel documentation to get a better understanding of the options. Avastar’s default settings should be good for most situations. 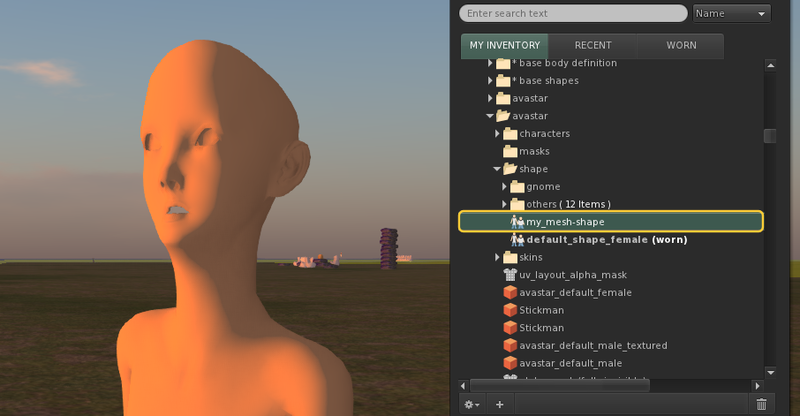 Remark: In general it is advisable to prepare your Rig before you bind meshes to it. 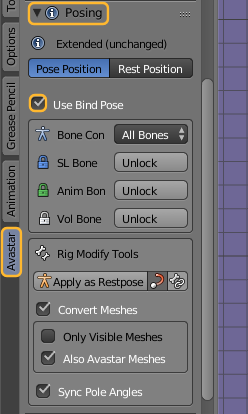 However, if your Rig has already bound meshes, then either unbind the meshes before you edit your rig, or at least make sure the Convert meshes option is enabled before you apply as restpose. If you forget to do this then the bound meshes will return back to their original restpose (T-Pose). Note: If your rig only used rotation when you posed your Rig, then in most cases it is sufficient to direct the SL Importer to import only with Weights. 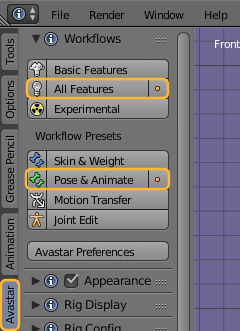 However if you have added extra joint offsets to your rig for example by editing the Rig in edit mode, then you better import your rig with weights and with joints. Make sure altering between “Pose Position” and “Rest Position” does not change your rig. Now you should test your meshes and possibly optimize your weights. Important: You most probably have to fine adjust your weights now, regardless from where you got the weights. 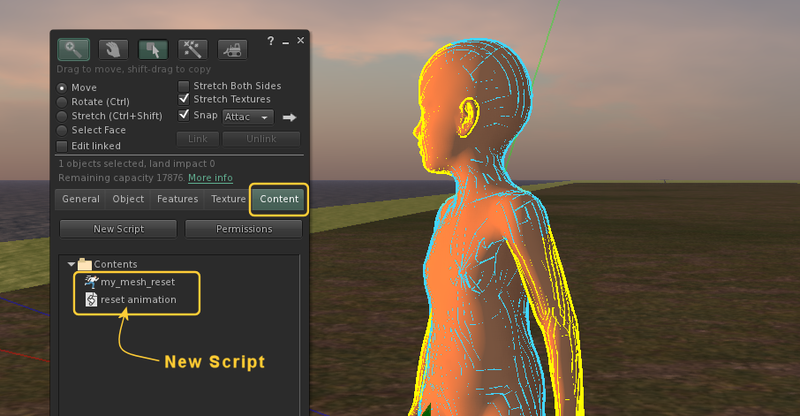 You will try out various poses and appearance slider combinations to make sure your Meshes behave as intended. If you see distortions then most probably your weights are not yet fully correct. This is where you need experience and a lot of patience! Be ready to take your time to get optimal results. Select your attachments and export with the Avastar Collada exporter as usual. 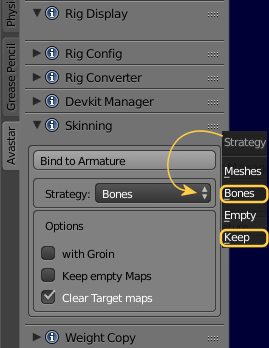 Avastar should automatically set the correct advanced options for the Export. The option Use bind Pose is enabled. 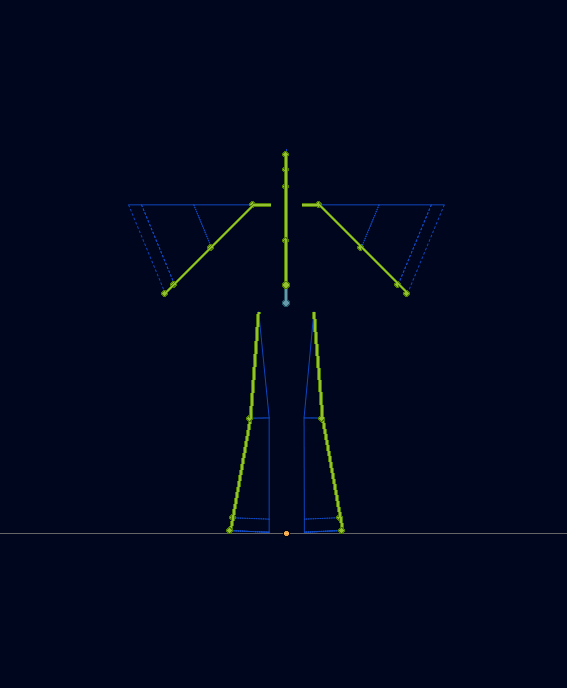 Now the Avastar Exporter knows how to convert this rig into a standard T-Pose rig without distorting the Meshes. 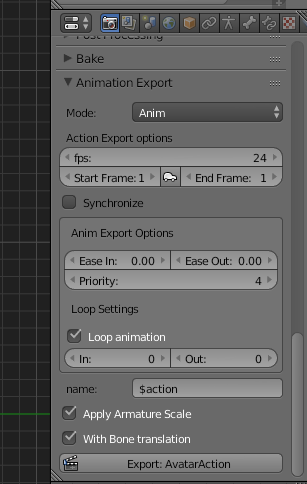 When you have enabled the options with Reset Animation (a .anim file) and with Reset Script (a LSL script), then you get 2 additional files exported. You might need those files later when you want to wear your mesh in Secondlife, see below. 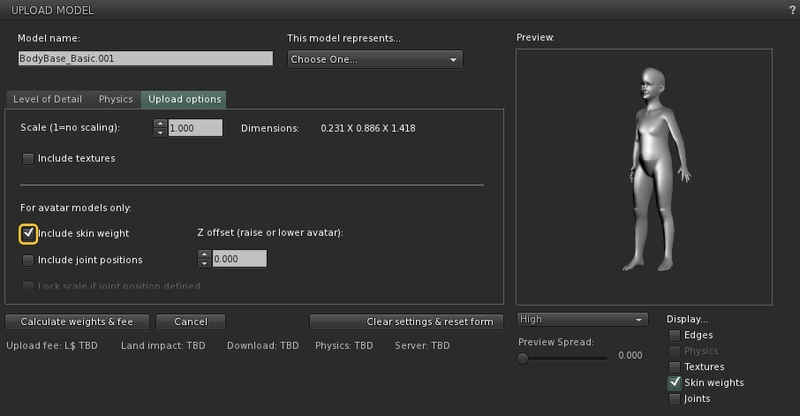 When you import your Bind Pose mesh (the .dae file) to Secondlife then make sure that you enable include skin weight in the upload options tab. Please make sure the option include joint positions is disabled !!! You might have modeled your Mesh with appearance sliders in Blender. In that case you must make sure that you wear the corresponding Appearance shape in SL as well! Otherwise you may not see exactly what you modeled in Blender. 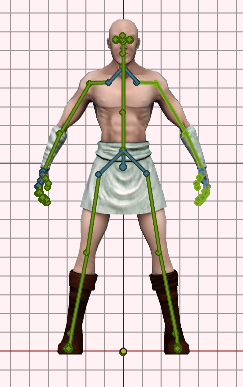 Sometimes, especially when your rig has been edited a lot (for tinies, giants, creatures) you may find that your mesh is somewhat oddly deformed in the SL Preview window. 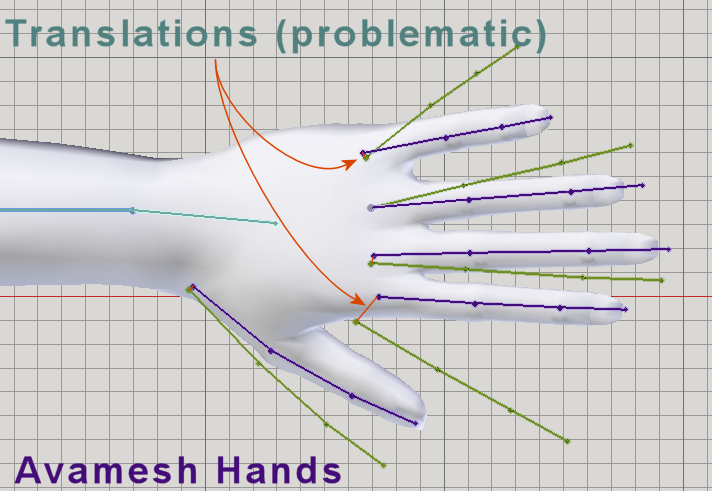 This does not necessarily happen, for example when you import an A Posed Mesh where only the arms and legs have been rotated, then you will not see visible deformations. 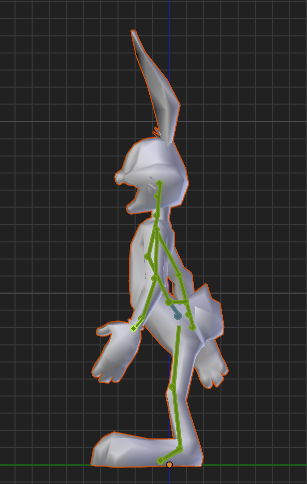 But if you see unwanted deformations, then you may want to also import the Reset Animation (.anim file) for your mesh. That is easy: Just run the animation. 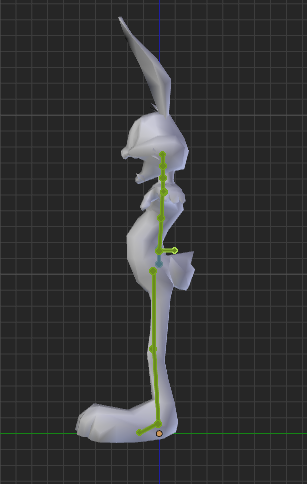 The animation is a single frame loop with priority 0 (zero) which – once started – moves all bones into their Bindpose, unless the bones are moved by another animation with higher priority. So you should see exactly what you see in Blender as soon as the reset animation runs. 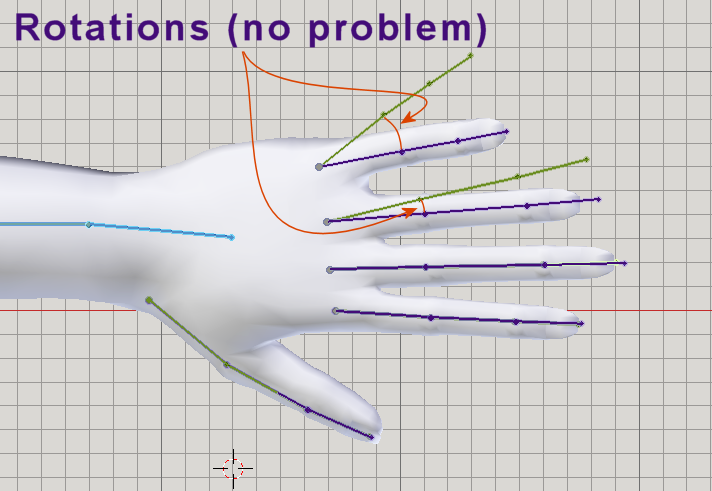 You even can stop the animation and keep your shape clean (no deformations). 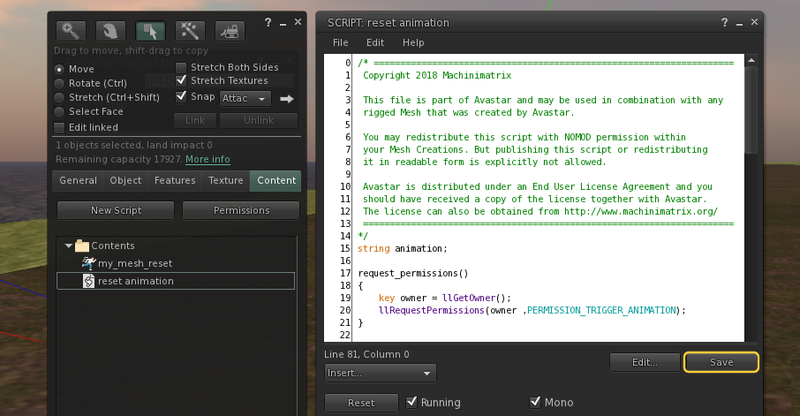 The Script has been generated by Avastar in the very first step above when you enabled with Reset Script during export. If necessary just export your mesh again with that option enabled. 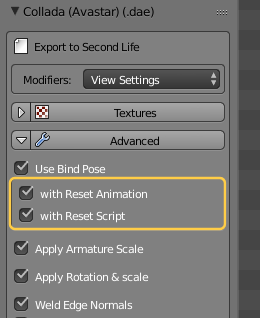 Now open the generated LSL Script (the file is named like your .dae file but with the LSL extension) and cut/paste the file content into the reset animation script in the Secondlife Viewer. the Script has ~80 lines of code and comments. As soon as you have saved the script the reset animation is played constantly in the background. 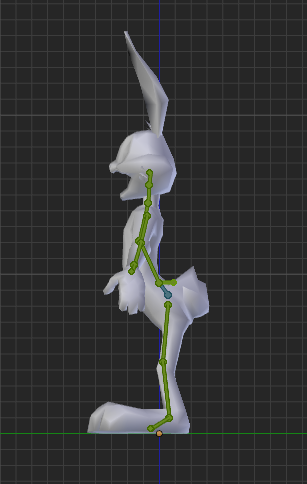 So you mesh should move all its rigged bones into the restpose. 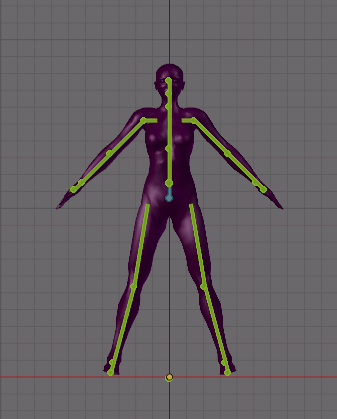 However as soon as you animate your mesh – for example by starting the default walk animation, you see that your mesh behaves nicely and as expected. If your mesh starts looking weird again (which should never happen) you always can get it back into form by resetting the reset animation. 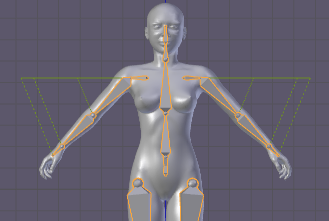 (1) In Blender you matched your bind pose perfectly to your own model. (2) In SL we use the original T-Pose rig. 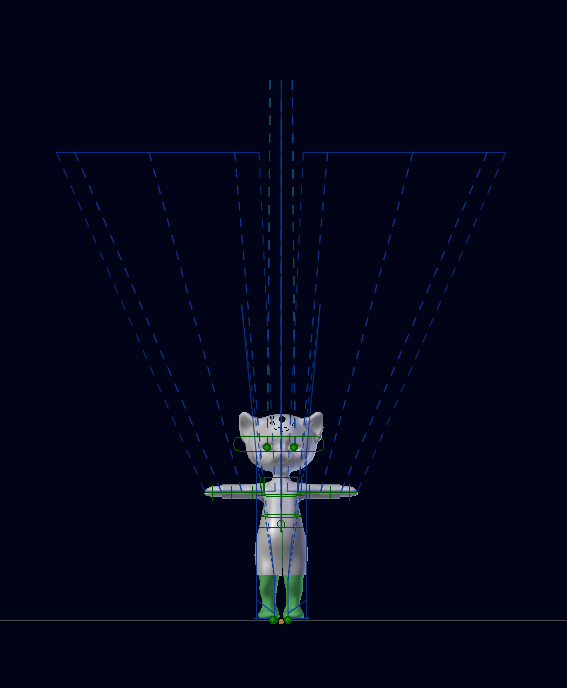 Hence the character is forced into the T-Pose which might make your model look odd and distorted. Note: in this case the distortions happen on the chest. 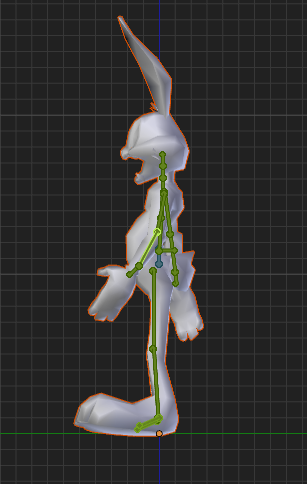 This is where the Skeleton was changed most from how it is setup in T Pose. All you need to do is adding poses (single frame animations) and gestures to replace the default animations. Then you finally get back what you expected. 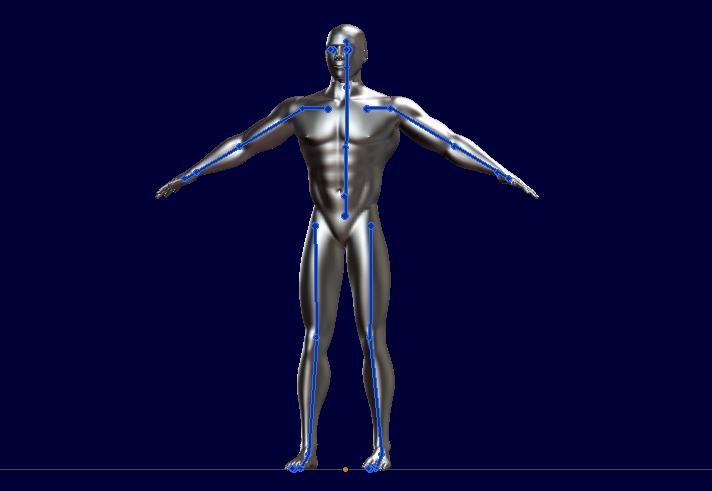 However as soon as the poses terminate your mesh will fall back into the distorted restpose. 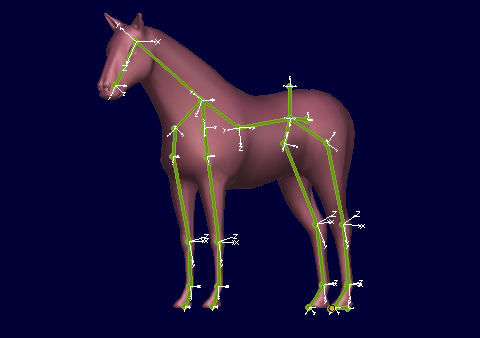 So you need to use an AO (animation overrider) to permanently apply your poses to your mesh. You maybe want to add an animation loop as well. In the images below you see a compatible rig for this model. It is not optimal but at least it will work with the standard Avatar animations. Same Custom Rig in Front View. Bind to Pose in general is very capable instrument for your rigging. However it works best if the modifications on the Rig are small. 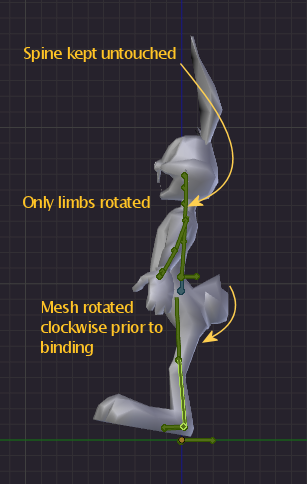 Ideal candidates for Bind to Pose are A posed rigs. For anything else it might be easier to Custom Rigs with joint offsets.